Preface: A few years ago, my four baby roosters grew up and started fighting each other over their two sisters. It was evident, daily, that SOMETHING had to give. This is a 'what if scenario at best, but more likely, it's just the product of my over active imagination! I have often wondered what it would be like to be Dr. Doolittle . . .. ............There was a stand off yesterday around supper time. RooRoo, the patriarch rooster, came knocking at my front door. I could see the others through the full glass gathered in a tight line behind him, their brutal faces pressed together in conspiracy. My throat pounded with a throbbing pulse, but I stumbled to the door and let it creep open allowing the tribe of them in. Little Nell was the last to skip through the door. I spose she couldn't help it, but she flutter up a foot and nailed me on the thigh with her beak. It was quick and probably hurt her more than me. ......Yeah, these chickens were upset with me. ...... The dogs were hiding behind my bed (as instructed). The tribe made their way through the foyer, into the dining room and stopped at the bottom of the table next to the vining plants. Roo lifted his right wing and retrieved a small note pad and cleared his craw . . .
1 - Fresh cracked corn (warmed slightly in the oven) available by 5 am every morning. 2 - Silk sheets for the laying boxes for the females. 3 - Fresh grit mixed with ground cherry flavored Pop Tarts. 5 - Store bought Earth worms twice a week. 6 - One hour a week of The Animal Channel (with popcorn). 7 - Some new females for my four boys and me - he looked at his two daughters and shrugged, they cast their forlorn chickie faces to the ground and . . . smiled. 8 - A free vacation to the Canary Islands. He looked almost embarrassed at this request. ......He threw his head back and crowed loudly, a centurion belch that lasted fifteen seconds before he thrust his head forward squeezing out the last of it. 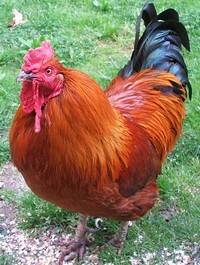 Six pictures fell to the floor at the sheer rumbling magnitude, then he stared at me directly - rooster to human steward. ......"You've always been good to me and my own," he said, searching my face empathetically, "and I have so appreciated the attention you've given us, especially my dear departed Annie." ......A tear threatened at the corner of my oculus, but I jammed it back with a quick blink and spoke evenly, "Rooroo, you and I have know each other for a few years now. I've always respected you, even that time I caught you and Annie . . . well, you know - not in front of the children," I whispered. ......The boys got a befouled look on their faces, the girls clucked and shuffled a bit, and their father blushed the color of candied apples . . ..
......"Anyway," I continued, "I'm just rather surprised at this dramatic display . . . doesn't seem your style at all, Roo." ......He toed a little nearer, "Let's discuss this privately, may we?" He held up his soft, left wing pointing toward the living room whilst turning toward the children and instructing them to retire to their quarters. I followed Roo into the living room, sat in my wing back and offered my hassock for his use. He obliged and settled down in front of me, easing onto his haunches and began to speak pensively . . .
......“When Annie disappeared a few months ago, I was so lost and unsure of myself,” I thought he was going to cry, but he didn't, and continued as he looked out the window behind me. “ The children were always her department . . . ah well yes, I did my part protecting them, comforting my daughters in that special way. (I don't think Annie cared for that, but she never told me so.) Now that she's gone, they want things I'm not able to provide little things their mother always attended to . . ..” He jumped off the hassock and began toeing an imaginary line in front of me. ......He continued then, a perfectly straight line pacing toe to heal toe to heal. I reached down and scooped him into my arms to sit like a stuffed toy on my lap. Roo leaned against me, the worries of these past months draining quickly from him as I stroked the back of my beautiful, old friend. ......“They're brats, you know Roo. Kids are different now days, always demanding more, even when you've given all you're capable of.” He cooed softly, a sound I'd heard him use many times with Annie. ......Then and there, my old friend and I came to a deeper understanding of one another. I promised to meet part of the demands, like store bought earth worms and warmed cracked corn at five am. I told him Pop Tarts wouldn't be good for the children - he agreed. I told him a trip to Ireland would happen before those young studs of his ever saw the Canary Islands. ......I hoisted him onto my shoulder and we went to confront the brats together . . ..